European markets ended the first session of the new trading week with mixed results. The German DAX fluctuated between small gains and losses throughout the session as trade tensions between the US and China intensified, in addition to new Brexit concerns. Germany's factory orders decreased the most in one-and-a-half years in June as both domestic and foreign demand deteriorated on trade tensions. Looking ahead to the rest of the day, the Asian stock markets seem to have started out on a strong note and European stock indices are likely to follow. From a technical perspective, we expect a strong opening in the DAX however we are still trading below the trendline and most importantly below the 200-period MA. Therefore weakness is expected to continue for the next few days unless some major fundamental data reverses the current direction of the trend. 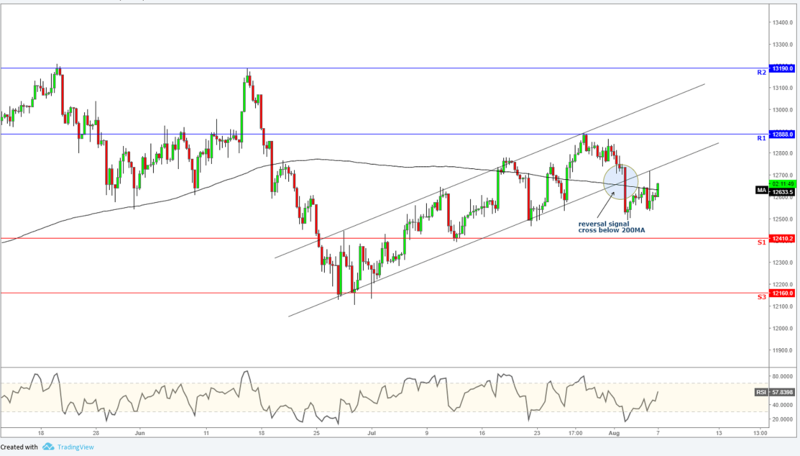 Watch out for an important support level at €12,410. The RSI looks mixed to bearish suggesting downwards pressure.